The no-fly zone for drones around airports is to be extended following the disruption at Gatwick in December, the government says. From 13 March it will be illegal to fly a drone within three miles of an airport, rather than the current 0.6-mile (1km) exclusion zone. The government also said it wants police to have new stop and search powers to tackle drone misuse. Gatwick was shut for more than a day after drone sightings near the runway. It caused chaos for travellers, affecting more than 1,000 flights and about 140,000 passengers. Since then airports have been trying to improve their procedures to detect drones, but they continue to see illegal flights near their perimeters. In January departures at Heathrow were temporarily stopped after a drone was reportedly sighted. Transport Secretary Chris Grayling said: “The law is clear that flying a drone near an airport is a serious criminal act. “We’re now going even further and extending the no-fly zone to help keep our airports secure and our skies safe. It is already illegal to fly a drone above 400ft or within 1km of an airport boundary, and those who recklessly or negligently endanger an aircraft with a drone face up to five years in jail. The government said the new stop and search powers would apply to people suspected of using drones maliciously nears airports. The powers, to be included in the government’s new Drones Bill, would also allow police to access electronic data stored on a drone. The Association of Remotely Piloted Aircraft Systems (Arpas UK), which represents the drone industry, welcomed the wider no-fly zone but cautioned on the stop-and-search plans. “Police will need to know exactly what the rules are and in exercising their powers do so in the right way,” said Rupert Dent, an Arpas UK committee member. 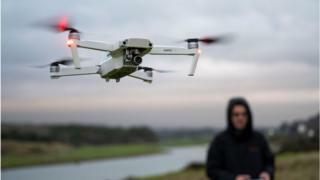 Following the Gatwick disruption, Sussex Police arrested a drone enthusiast and his partner who lived near the airport, but they were released without charge on 23 December, having been cleared of any involvement. In a statement Sussex Police said they had still not found the perpetrators, despite having 130 eyewitness accounts of illegal drone flights. “We continue our criminal investigation, which is challenging in its scale and in the type and quality of evidence immediately available,” a spokeswoman said. What are the markets telling us about the election?